With real estate apps for agents and brokers constantly evolving and becoming more streamline, operating systems have to do the same. For years, technology companies have been expanding and trying to one up one another, adding new capabilities to seem more attractive to consumers. While companies such as Apple and Android are at war for market share, real estate professionals are reaping the benefits in the form of mobile app features that help them grow their clientele, communicate more efficiently, reach a broader client base and market themselves more effectively. With that in mind, which operating system is the right fit for real estate professionals in today’s market? With 54% of the global smartphone market, Android has become the undisputed leader in global market share. This operating system is especially worth considering if you have a lot of international real estate clients or listings. Another pro for Android is its system-wide Google Maps integration built in. You can get turn-by-turn directions as a standard feature, which makes Android ideal for real estate professionals who rely on mapping and directions when working out in the field. It’s also beneficial for consumers using a real estate professional’s mobile app to be able to access easy-to-follow directions. Named the choice for American smartphone users, Apple as more than 50% of domestic market share. One of the best aspects about Apple’s iOS is its Apple-exclusive communication features such as iMessenger. For real estate agents and brokers, keeping the lines of communication open is key in helping obtain and maintain a strong clientele list. While other operating systems are more prone to have bugs and glitches, iOS is designed from the ground up, which means a user is less likely to experience system issues. 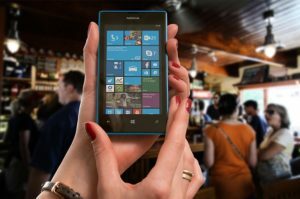 While Windows mobile operating system still has a ways to go before its reached the popularity of iOS, its mobile devices integrate with Microsoft office programs that many real estate professionals use heavily, including Word, Excel, PowerPoint, and Outlook. Additionally, the Windows platform is uniform across phones, tablets and PCs, which makes it easier to sync and work on multiple devices. Messaging has always been a strong area for BlackBerry, and the company continues this tradition with its BBM and email features. Messaging and communication capabilities are of the utmost importance to real estate professionals, so when thinking about a mobile device that has been praised for its ease of use with the keyboard, real estate professionals may just want to take another look at BlackBerry. The ability to multitask is also a major point for BlackBerry’s platform, allowing users to switch between several active apps. While SnApp Real Estate builds high performance real estate mobile apps that operate on iOS, we will help you streamline your business and connect with clients every day of the week. Take advantage of our easy to use and customize application technology, and make buying and selling easy. This entry was posted in ios app development, real estate apps for agents, real estate mobile apps, SnApp Real Estate and tagged ios app development, real estate apps for agents, real estate mobile apps, SnApp Real Estate. Bookmark the permalink.